Protest against congestion charge that cuts minicab drivers take home pay by as much as 25%, while doing little to address environmental concerns. Demonstration builds on two previous protests and shows rising anger among drivers, who feel ignored by the Mayor of London. 28 January: Thousands of minicab drivers will gather outside Transport for London's (TfL) headquarters on Blackfriars Road today, in what will be the biggest-ever demonstration of minicab drivers in the UK. The protest called by the Independent Workers Union of Great Britain's (IWGB) United Private Hire Drivers (UPHD) branch against regressive congestion charges on minicabs to be introduced in April, builds on two previous demonstrations that were attended by hundreds of drivers. The growth of these protests shows the rising anger among minicab drivers that feel ignored by Mayor of London Sadiq Khan, who refuses to speak to them or address their concerns. The protest will go on today (28 January) from 16:00 - 18:00 and drivers vow to repeat the protest every Monday. Hundreds of stationary minicabs will block large part of the Cut, Union Street and Blackfriars Road. Drivers will be joined by Labour councillor Maurice McLeod, who will call on the Mayor of London Sadiq Khan to scrap the congestion charge extension. The policy introduced by the Mayor and TfL amounts to a “tax on the poor” and will see minicab drivers’ take home pay slashed by up to 25%, while doing little to reduce congestion. TfL expects its policy to reduce congestion by only 600 cars per day or just 1% of the private hire traffic that goes through the congestion zone. TfL's own impact analysis showed a disproportionate impact on poor and BAME workers with 71% of TfL licensed minicab drivers hailing from designated deprived areas and 94% identifying as BAME. Black cab drivers, who are 80% white British, continue to be exempt from paying congestion charge. A cap on the total number of minicab driver licenses. A licensing cost levy on private hire operators, based on the frequency of private hire vehicles from their fleet appearing in the congestion zone. To reduce the amount of time drivers spend on the road waiting for passengers, TfL should provide dedicated rest spaces for at least 4,000 minicabs. Minimum wage enforcement, which would provide the necessary incentive for operators to reduce the number of cars on the road. 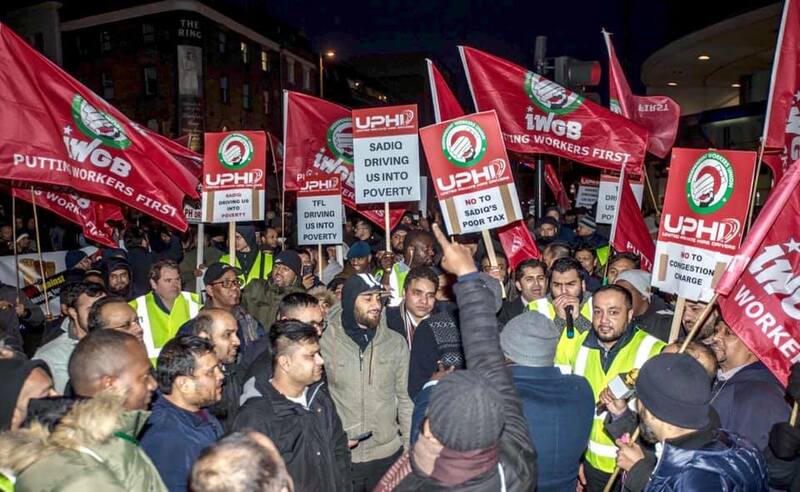 Abdurazak Hadi, chair of the London committee of the IWGB's UPHD branch, said: "The Mayor's new regressive congestion charge will leave minicab drivers like myself, already suffering from Uber's poverty wages, unable to feed our families. London elected the Sadiq Khan on the promise of a fairer city, but instead of targetting the operators like Uber who are really responsible, he is punishing working families. We desperately need the Mayor to listen to us and scrap his ruinous tax on the poor."